The first time I wittingly drank Walong tea was a few years ago when the brother of a friend of mine got some Autumn tea from this Man Zhuan village. Some people talk of Walong being the ‘king’ of Man Zhuan teas. It was surprisingly weighty for an Autumn tea. That lead to some other folks and I exploring the area and sourcing some tea from the same village, albeit from different tea gardens. This is the result. A fair bit of tea comes out of Walong and some of it is a mixed bag. Like Manlin, Walong has, at lower elevations seen a lot of encroachment from rubber trees. They’re all some way below the village which, like many Man Zhuan villages, is not at a very high elevation – around 1200 metres (see a HM post here for some photos and intro to Walong), but it’s surely had an impact on the nearby environment and you have to select your tea gardens carefully. Some of the best are in the forest area behind the village. It’s been just a year since this tea was pressed using a hand operated wooden press, so it’s a bit tighter than a normal stone pressed cake would be. There’s nothing particularly remarkable about the dry cake and leaves. The wet leaves give off a slightly fruity, floral aroma, with hints of camphor and tobacco. The initial steeps are clean, smooth. It’s got some decent depth and some ‘thickness’. The fragrances are quite muted, as they were when the tea was first made last spring. As the steepings progress some astringency emerges which rests on the middle of the tongue for a couple of seconds, but quickly dissipates, so it’s not at all unpleasant, and is matched by the thickness and huigan. When the steeping times are increased the tea becomes quite bullish and brings me back to the first time I drank Walong tea, but here it looses a little smoothness – the shui lu feels very slightly disjointed. When steeping times are reigned in a little the tea becomes more well mannered, and the shui lu, the progression of the broth as it travels though the mouth to the throat, is smooth, from rukou to huigan. The tea drops nicely into the thorax and feels pleasant in the throat. 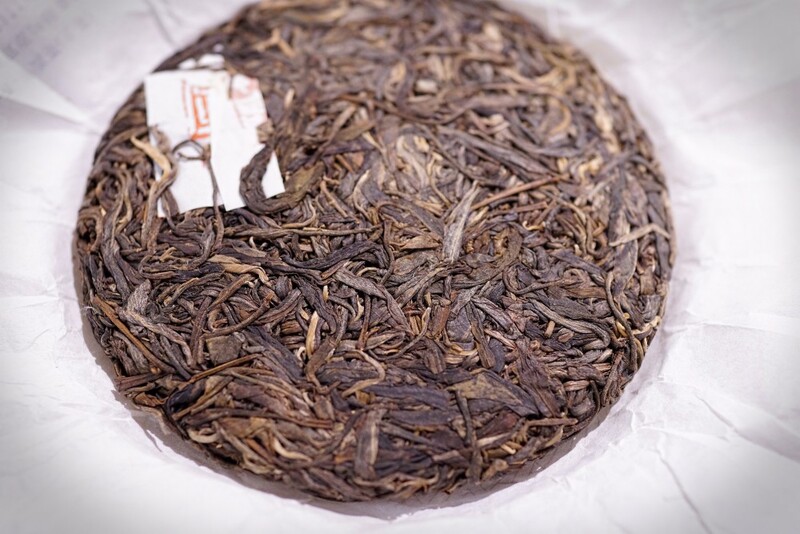 One can see from the wet leaves that the tea has been well processed with a good uniform colour and no burning or redness on the leaves or stems – nicely fired. The broth is a fairly strong mid-yellow. Given it’s age, it’s perhaps not surprising that it has a little bit of that ‘awkward adolescent’ quality to it, but it’s strengths are still easily discernible and in another year or two it will surely be through that difficult phase. As well as its thickness and strong flavour, the tea has houyun that lasts well enough, making it generally a good and memorable experience, though perhaps not for a novice Puer drinker.